When you leave a job, you generally have the option to rollover your 401(k)/403(b) to an IRA or to your new 401(k)/403(b) plan. In our history, I’ve always rolled over our accounts to a Fidelity Rollover IRA. Dad and I each have one – collecting all of our previous employer plans into one. They’re at Fidelity because that’s where my first 401(k) was and it’s been convenient. And currently, Dad’s 403(b) and 401(a) are through Fidelity. For the majority of my working career, I had a SIMPLE IRA through Fidelity – I was able to buy/sell *anything* Fidelity offered for a $25/year fee (plus commissions, mutual fund fees, etc). I learned early on to just buy NTF (no transaction fee) funds and save myself that fee, but I didn’t understand mutual fund expense ratios. I just picked what looked good and was recommended – yeah, I was naive. Over the years though, I’ve learned better. 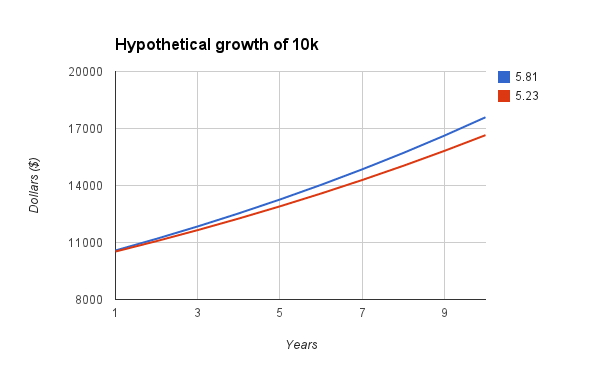 When my company moved from a SIMPLE IRA to a “real” 401(k), we had some pretty pathetic choices, I had already learned about mutual fund expense ratios by then, and the lowest possible fee was 0.23% for a Russell 3000 Index private fund (seriously, there was no public ticker symbol for it). I put 100% of my money into that fund, and made up the rest of our allocation in our Rollover IRAs and in Dad’s 403(b). What if I didn’t have another option? I would have had to try to make up my desired allocation from high fee funds ( > 1%) and would have spent dearly for it. Most recently, up until yesterday, we had had a 5% allocation in REITs – and Dad’s 403(b) offered a REIT fund with what I thought was a halfway decent fee: 0.77% (CSRIX). With all of our other expense ratios being less than 0.25% (most in the 0.05-0.07% range), I was seriously considering eliminating our real estate allocation. I did some more research on whether I wanted to keep the real estate in my allocation enough to continue paying the fee. I also looked through Fidelity’s offerings, and found FSRVX at a 0.09% net and 0.19% gross ER – I pay .09% until Fidelity decides to not discount it anymore. It gave us exposure to real estate for a lot less. I sold the CSRIX shares in dad’s 403(b) account and bought FSRVX in my Rollover IRA. We have an agreement that my account maintains higher risk than his does, so I get things like REITS, small cap, emerging markets, etc and his focuses more on bonds and total market. Since we balance our allocation across multiple accounts, it really doesn’t make any difference. How do fees play into this? Most people would agree that a fee of 0.19% is better than a fee of 0.77%, but by how much? If the fund’s performance was 6% annually, then the fund with .19% fees would actually return 5.81% and the fund with .77% fees would return 5.23% – which would you rather have? Over 10 years, that’s a huge difference. The charts below assume a starting contribution of 10k, and no continuing contributions (meaning “the real world” has an even larger difference). As you can see, there’s a $940 difference at the end of ten years. It grows to a difference of $4441 if you contribute 10k each year. And that’s the difference of 0.58% in fees – imagine what you’re paying if you have fees over 1%! If you have the opportunity to roll over an old workplace plan – unless you’ve got stellar choices already – it sometimes pays to do so. Most brokerages offer rollover IRAs – pick your favorite low-fee broker and put everything together. You’ll have access to their full range of funds, and there are very few online brokerages which don’t offer NTF funds of some sort, although Vanguard is well known for their low cost index funds (in my opinion, Fidelity’s Spartan funds are pretty darn close and not worth moving everything). You’ll still have to pick the best options in your employer plan, but you’ll have the flexibility to buy cheaper funds elsewhere (but still tax advantaged). And I would be remiss in not mentioning this, but if you have a rollover IRA hanging around – I really don’t recommend trying a backdoor Roth, you’ll get royally screwed on taxes. This disadvantage can be overcome by rolling any IRA you have into a current employer’s plan. This entry was posted in Finances, Investing and tagged fees, rollover IRA on December 18, 2014 by Mom.